Water fountains offer a lot more enticing way for dogs to drink compared to ordinary drinking bowls and rollerball-tipped faucets. These drinking stations provide a much cleaner and safer drink for pooches because of the continuous flow of water, preventing the formation of sediments in the bottom of the pan and keeping the drink tasting fresh and clean as ever. Selecting the best dog water fountain shouldn’t really be difficult. However, in case you’re having some issues zeroing in on the most appropriate for your canine friend, then have a look at our list of the 5 best dog water fountains. 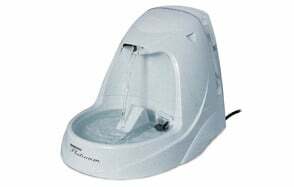 The Drinkwell line of the best pet water fountain products from PetSafe is one of the most trusted and most revered by both veteran and novice pet owners when it comes to providing their pets with the safest and cleanest drink. The Platinum is a nifty dog water fountain that has a 168-ounce capacity, fully capable of quenching the thirst of several dogs for the whole day. Adding to the thirst-quenching capabilities of the Drinkwell Platinum is a reservoir that comes built into the chassis of the fountain. At any rate, you don’t have to worry about your pooch running out of fluid to drink. While it is made of plastic, you can feel safer in the knowledge that it is free from BPA and other chemicals. The spout is positioned high enough to allow for free-fall while the bubbles that it creates at the bottom of the dish helps provide aeration for the drink. It operates exceptionally quiet, too, and comes with a highly audible sound to signal that its reservoir already needs some refilling. Technically, the Platinum enjoys a good following because of these many useful features at a price that is right on the mark. This dog water dispenser from PetSafe boasts of a unique 360-degree circular dish serving as catchment and reservoir for the water that falls from a central tower. The Drinkwell 360 dog drinking fountain holds 128 ounces of fluid that gets circulated through the system. A removable and replaceable carbon filter helps make sure debris and other particles will be filtered effectively, making sure your pet’s drink is as safe as can be. Adding to the safety of the 360 is its stainless steel construction which, as everyone knows, has fully integrated antimicrobial properties. This also helps remove bad taste as well as odor to make the drink more enticing. The Drinkwell 360 comes with fully adjustable control cap so you can create a more efficient water flow depending on the needs and ‘preferences’ of your canine friend. Add to this the ability to change the way the water falls from the tower in 5 different ways makes the Drinkwell 360 an exceptionally designed pet water dispenser. If you don’t have multiple pets at home, you clearly don’t need a bulky dog water fountain to quench the thirst of your pooch and keep it well hydrated. For that, we recommend the Pioneer Pet Raindrop Stainless Steel Pet Drinking Fountain. Unlike other pet drinking fountain that comes with a sufficiently high water source, the Pioneer Pet Raindrop comes with a gently sloping dome where fluid cascades with grace. It doesn’t create turbulence in the dish, although it still provides for an efficient circulation of the fluid. The Raindrop also features a movable center spout so you can easily adjust the direction of the water flow, ensuring for a much quieter operation and smoother flow. Its stainless steel construction looks and feels sturdy and can be easily placed in your dishwasher. The stainless steel fabrication also helps aid in ensuring cleaner and safer water to drink for your pooch. The Pioneer Pet automatic dog waterer also comes with a replaceable charcoal filter to help enhance the antimicrobial properties of stainless steel. Its sleek design should make it ideal for smaller homes where space can be quite an issue. The PetSafe Drinkwell Pagoda deserves a place in this list of the best pet fountain for dogs as it is made of highly safe and hygienic ceramic. Its non-porous surface makes it exceptionally easy to clean and sanitize. However, what makes the Pagoda dog fountain quite unique is that it features two working drinking platforms so taller dogs can drink from the top layer while smaller breeds and puppies can quench their thirst on the bottom section. Either platform provide clean and fresh drink as the Pagoda is already fitted with carbon filter that you can easily replace in instances where it has already accumulated too much dirt and debris. The filter helps to provide an odorless and tasteless fluid that doggies will surely appreciate. It only comes in a rather small 70-ounce size, though. So it may not be the ideal solution for households with multiple pets. Nevertheless, the free-falling nature of the water flow can help oxygenate the drink, killing susceptible bacteria by introducing oxygen into the mix, and providing a much safer fluid for your pooch to take. 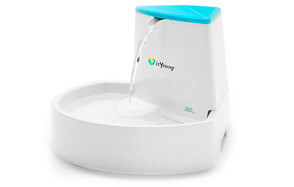 Rounding up our list of the 5 best pet fountain products is this unusually designed dog water fountain from isYoung. The isYoung is designed for placement in the corner of any room since it has a 90-degree angle on one section and fanning outwards in a circular fashion. The design is excellent for those who would like to position their pets’ drinking station in the corner of the room to help minimize spills and mess. The triangular water tower houses the low decibel-running motor which circulates 88 ounces of clean water through its built-in charcoal filtration system. The motor itself provides energy efficiency that will save you extra dollars on your monthly electric bills. The isYoung also comes with fully adjustable water flow controls and a receiving ramp which effectively reduces the sound or noise of splashing water while still providing adequate oxygenation of the drink. It is made of plastic, sadly. The good news is that it’s BPA free. At any rate, the isYoung provides an inexpensive yet equally effective way to entice your pooch to drink a lot more. Picking the right pet water fountain for your pooch should be a pretty straightforward endeavor. You only need to make sure that the water is circulating through the system and you’re good to go, right? Add a touch of something elegant and you’ve got a dog water fountain that looks more like a décor than it is an automatic dog waterer. Sadly such is not the case if you really want to provide safe drinking water for your pet. The only way you can ensure you’re getting the right product is to spend a little bit more time in finding out some of the essential elements of a good pet water fountain. You have quite a handful of choices here. 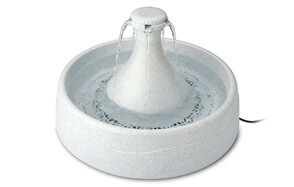 The three most common materials used in pet fountains include stainless steel, ceramic, and plastic or vinyl. Stainless steel and ceramic are quite pricey although they provide exceptional properties when it comes to safety and hygiene. Plus the look of either ceramic or stainless steel can definitely add to the appeal of your home. This is not to say that a plastic water fountain for dogs cannot be as elegant. They can, too. Additionally, they will also cost less than stainless steel or ceramic. However, to really optimize the advantages of plastic pet waterers you will need to make sure that it doesn’t contain BPA or any of the other harmful chemicals that are often used in the manufacture of such products. Two of the most common filtration systems in such products are charcoal and carbon filters. Most people think that these are essentially the same. While it is true that charcoal contains carbon, it also has residues of oxygen and hydrogen since it is typically made from pyrolyzing wood. It is this unique molecular structure of charcoal that gives it its amazing adsorption capabilities. This allows it to attract pollutants and other microscopic debris in the water as a means of filtration. Carbon, on the other hand, is an element just like oxygen and hydrogen. By itself carbon doesn’t have any intrinsic filtering properties. However, we have found that many manufacturers have come to use the terms ‘carbon’ and ‘charcoal’ filters as one and the same. They are branding their products as containing carbon filters, not charcoal, since the idea of using a byproduct of wood pyrolyzation is simply unnerving to most people. Carbon, it would seem, offers a ‘safer’ profile for the product. What this essentially means is that products that are labeled as having carbon filter are essentially talking about activated charcoal filters for the simple fact that there is no such thing as a pure elemental carbon filter. You may also want to get a product that will not create too much noise. This is important as the sound of the motor running can interfere with the restful sleep of your pooch. It is therefore, critical that you look for a unit that has a quiet operation. Also, the splashing of water can be quite annoying, unless you’re going to turn it as a soothing sleep aid. If not, there should be a mechanism where the fall of water can be broken to facilitate a gentler flow. As much as possible the various components of the device should be easy to remove, clean, and reassemble or replace. If it can be cleaned through your dishwasher then that would definitely be a big plus. Why is Water Important for My Dog? All living organisms require adequate fluids to function. Cells work best if they are in a liquid environment that sustains life. Nutrients and other important chemicals are better transported to and from these cells, ensuring optimum health for any living organism, including us and our beloved pet dogs. Inside the dog’s body are a series of chemical reactions that require fluid to occur. Without this watery environment, many of these chemical reactions simply will not take place. If this happens, then our pooches will not be able to utilize the various nutrients that you have given them through their food. Water is also important in the regulation of body temperature for which dogs are not really good at. For humans, if our body gets too hot, we perspire to get rid of the excess heat. Dogs don’t perspire. They pant. As they pant, they are slowly releasing carbon dioxide and moisture into the outside air. This helps them lower their body temperatures. Unfortunately, this is often fast enough to help lower down their body temperatures to more physiologically normal levels. As such, they will require plenty of water especially after an intense physical activity, play, exercise, or coming from under the sun. In a word, water is an element that all organisms need to survive, including our dogs. While it doesn’t contain calories or any nutrient value whatsoever, it provides the framework upon which the calories and the nutrients found in food are utilized by the body. Without water, life simply ceases to exist. We now know how important water is to the health of your dog. We should, thus do everything we can to help our dogs drink plenty of water. Here are some tips for you to consider. Place several water bowls or drinking fountains all over your house, especially in areas where they frequent. However, just make sure that this is not located in the same area where they usually eat as well as eliminate. You don’t want to drink in your toilet, too, do you? Make sure your pet will be able to drink without having to strain its neck reaching for the water in the dish. That is why a water fountain is ideal since the spout is already located at a high enough position so your dog doesn’t have to bend extremely low to drink. Add some natural flavoring in your canine friend’s drink. It can be chicken or beef flavored broth or even the fluid from a can of tuna. This helps provide a more enticing flavor for your pooch, making it want to drink more. Alternatively, you can also add ice cubes into the bowl. Nothing beats refreshingly cold drink especially on a hot day. If you’re not using a water fountain, make sure to change their water at least every 2 hours to prevent it from going stale and providing your pooch with fresh, clean water. It is for this same reason that water fountains are very useful as it minimizes frequent water changes or replacements. Clean your pooch’s container. Over time, sediments can form at the bottom of the dish which can make the drink quite unpalatable. Additionally, the interaction between the microorganisms in your pooch’s mouth and the watery environment can facilitate the growth of microbes in the bowl itself. So, you’d have to clean it thoroughly in between drink changes. Thankfully, with dog water fountains, you don’t have to do this very often. Consider giving your pooch wet or canned dog foods as these typically contain 70 to 80 percent moisture. You can also give dry kibbles, although you might want to add some water in it since these types of dog food only contain about 10 to 15 percent moisture. You can also try giving them treats that are rich in water such as watermelons. Just don’t give the seeds and the rind, though. Everyone needs water to survive, even our dogs. Dog water fountains are preferable to conventional bowls as these provide safer, healthier, and more hygienic drinking water for our pets. It also minimizes the hassle of frequent changing of the water and its eventual cleaning. Choosing the right dog water fountain is easy. You can start with our list of the 5 best dog water fountains or adhere to some of our tips on the selection of an appropriate device for your dog. Ultimately, it’s down to how you can get your dog to drink as much as it possibly can.